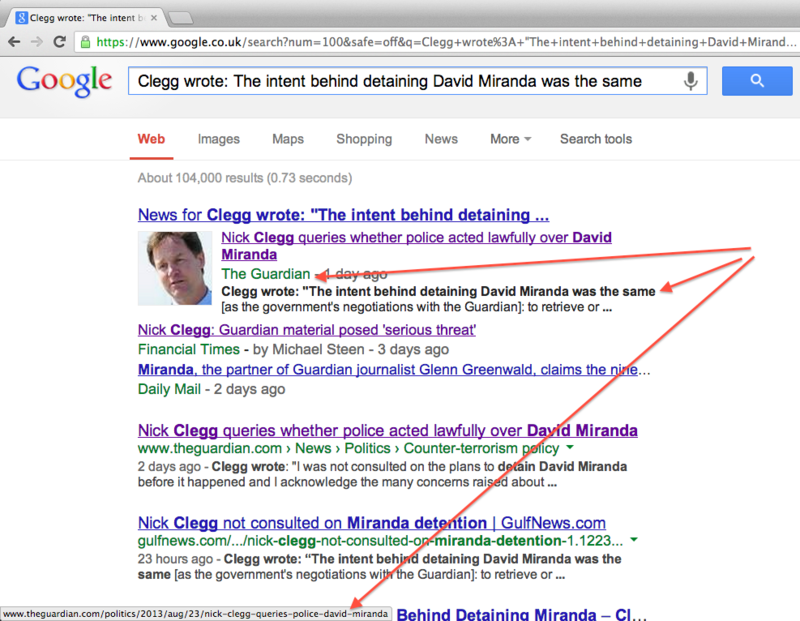 Mousing over the “Nick Clegg queries…” link at the top yields the link illustrated at the bottom; but when you click through to Nicholas Watt’s article it does not use the word “intent” or any other of the relevant text. I am trying to establish whether the matching search text comes from the original article or somehow from comments, or similar, on Watt’s posting. Or, it may too have been edited. But silently. Not sure yet. The Holodomor (Ukrainian: – , “Extermination by hunger” or “Hunger-extermination“; derived from ‘-‘, “Starving someone” ) was a man-made famine in the Ukrainian SSR and adjacent Cossack territories between 1932 and 1933. During the famine, which is also known as the “Terror-Famine in Ukraine” and “Famine-Genocide in Ukraine”, millions of Ukrainians and Cossacks died of starvation in a peacetime catastrophe unprecedented in the history of Ukraine. The estimates of the death toll by scholars varied greatly. Recent research has narrowed the estimates to between 1.8 and 5 million, with modern consensus for a likely total of 3–3.5 million. According to the decision of Kyiv Appellation Court, the demographic losses due to the famine amounted to 10 million, with 3.9 million famine deaths, and a 6.1 million birth deficit. Scholars disagree on the relative importance of natural factors and bad economic policies as causes of the famine and the degree to which the destruction of the Ukrainian peasantry was premeditated on the part of Joseph Stalin. Some scholars and politicians using the word Holodomor emphasize the man-made aspects of the famine, arguing that it was genocide; some consider the resultant loss of life comparable to the Holocaust. They argue that the Soviet policies were an attack on the rise of Ukrainian nationalism and therefore fall under the legal definition of genocide. Other scholars argue that the Holodomor was a consequence of the economic problems associated with radical economic changes implemented during the period of Soviet industrialization. The price of printers and related accessories could rise in the future as print giants such as HP, Canon and Fujitsu face the prospect of huge payments to copyright holders for selling devices that allow such works to be reproduced. A ruling from the European Court of Justice (ECJ) agreed that all printers that facilitate the reproduction of copyrighted works, by being connected to a computer, are liable for financial levies. However, UK businesses might avoid any printing price increases, at least in the short-term, as the nation approaches copyright law differently to other European countries. Vanessa Barnett, technology and media lawyer at law firm Charles Russell LLP, told V3 that the UK does not have a private copying permission under copyright law, which is the basis for the levy system existing in many other countries. "The levy system is essentially a way to compensate copyright owners for private copying by placing a levy on items which are used to copy. [Outside of the UK] this obviously has cost consequences for suppliers and users," Barnett said. "But the UK shouldn’t feel too smug: the possibility of a levy system in the UK still does rear its head every now and then. It’s particularly relevant right now, because of the push in the UK for a private copying right to be introduced into UK law. If that does happen, a levy may not be far behind." The ruling was made by the court at the request of the German Court of Justice for clarification on a case brought by publisher VG Wort against Canon, Epson, Fujitsu, HP and Xerox on the issue of payments for its copyright works that their printers allow to be reproduced in private. “It is open to the member states to put in place a system in which the fair compensation is paid by the persons in possession of a device contributing, in a non-autonomous manner, to the single process of reproduction of the protected work or other subject-matter on the given medium,” the EU ruling reads. In reality, this means printer companies will assimilate the levy into their pricing at the point of sale, thereby increasing the price of their goods, such as printers or printer ink, in a move that is likely to lead to higher prices for consumers and businesses alike. Furthermore, because the decision has been handed down from the ECJ and is binding across all member states, it opens up for the possibility for all copyright holders to demand levies from printer companies. The potential costs to the affected IT firms could be huge, forcing printing prices to rise significantly. HP told V3 it would comply with the EU copyright rules, but declined to comment on whether this would lead to price rises. "We believe HP’s printing systems provide the best overall value by offering customers an unrivaled combination of quality, reliability, speed and ease of use at competitive prices. We will continue to aim to protect our customers’ interests and the value we offer while diligently complying with European copyright framework,” the firm said. via UK firms could escape price increases if HP, Canon and Fujitsu raise printing costs to deal with EU copyright ruling – IT News from V3.co.uk. Since the beginning of the cybersecurity FUDgasm from Congress, we’ve been asking for proof of the actual problem. All we get are stories about how airplanes might fall from the sky, but not a single, actual example of any serious problem. Recently, some of the rhetoric shifted to how it wasn’t necessarily planes falling from the sky but Chinese hackers eating away at our livelihoods by hacking into computers to get our secrets and destroy our economy. Today, Congress is debating CISPA (in secret) based on this assumption. There’s just one problem: it’s still not true. The 27 largest companies have now admitted to the SEC that cyberattacks are basically meaningless and have done little to no damage. The 27 largest U.S. companies reporting cyber attacks say they sustained no major financial losses, exposing a disconnect with federal officials who say billions of dollars in corporate secrets are being stolen. MetLife Inc., Coca-Cola Co. (KO), and Honeywell International Inc. were among the 100 largest U.S. companies by revenue to disclose online attacks in recent filings with the Securities and Exchange Commission, according to data compiled by Bloomberg. Citigroup Inc. (C) reported “limited losses” while the others said there was no material impact. So what’s this all really about? It goes back to what we said from the very, very beginning. This is all FUD, engineered by defense contractors looking for a new way to charge the government tons of money, combined with a willing government who sees this as an opportunity to further take away the public’s privacy by claiming that it needs to see into corporate networks to prevent these attacks. If this was a real problem, wouldn’t we see at least some evidence? via As Congress Debates CISPA, Companies Admit No Real Damage From Cyberattacks | Techdirt. continues at Govt keeps Snooping Bill campaigners in the dark » Spectator Blogs.